Posted on 29 April 2014. Tags: cartels, international trade, limes, Mexico, revolution, U.S. The other day, I walked into a bar and ordered a gin and tonic. Instead of the customary lime wedge or wheel, my gin and tonic came equipped with a slice of orange. In response to my confused look, the server mumbled something about Mexican cartels. 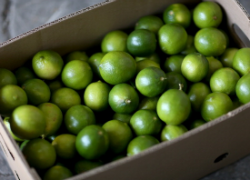 This piqued my interest and led me to discover that Mexican cartels, while a key ingredient, are not solely to blame for the current lime shortage. Flooding, disease, and a domestic lime shortage are also contributing to low lime supply and elevated prices. Lime prices in Denver are currently set to a troubling high of $.50 each at Safeway, and $.89 each at King Soopers. Large-scale orders are faring even worse, with 40-pound cases going for a whopping $100, compared to just $15 last year. 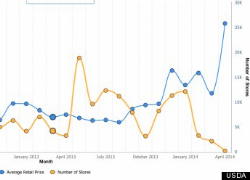 The graph to the right is a U.S. Department of Agriculture graph, republished by the Huffington Post, which demonstrates the price spike. This price elevation is mainly due to the age-old relationship between supply and demand. Supply is down because of a disease, huang long bing, also called “Yellow Dragon,” that has hit lime trees in the Yucatan and is spreading to other regions, such as the high export state of Veracruz. Unusually harsh rains in November and December also diminished lime yields because of damage inflicted to lime blossoms. Demand, however, has remained stable and is even increasing, particularly with the Americanized Cinco de Mayo holiday just around the corner. The panic, however strong in Denver, seems all the more real in New York City, where some people are growing their own in order to avoid the shortage and even profit from it. Things are getting even scarier in the Mexican state of Michoacán, where the conflict is coming to a head. The violent Knights Templar Cartel has been threatening and attacking local farmers, taking their limes and their lands hostage in order to take advantage of elevated lime prices. An interesting twist to this story is that a handful of farmers and laborers in Michoacán have taken up arms to protect their families and their livelihoods, forcing the Knights Templar to retreat out of the area. Some speculate that this could lead to revolution on a larger scale, particularly as people who had migrated to the United States return home to combat the cartel. Hopefully, this conflict will demonstrate to Americans that even the seemingly inconsequential decision of garnishing their beverage of choice with a lime wedge can lead to striking consequences abroad. Katie McAuley is a 2L, a Staff Editor for the Denver Journal of International Law and Policy and the incoming Candidacy Editor.